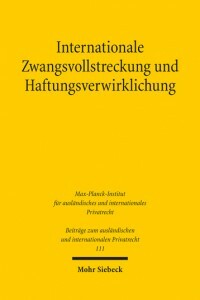 Our co-editor Tanja Domej from University of Zurich has authored a monograph entitled “Internationale Zwangsvollstreckung und Haftungsverwirklichung am Beispiel der Forderungspfändung” (International Execution and the Implementation of Liability). The volume has been published by Mohr Siebeck. It is written in German. Tanja Domej retraces the debates over the relevancy and meaning of the principle of territoriality for the cross-border attachment of debts from a comparative perspective. On the basis of an interest analysis, she presents perspectives for an appropriate approach to dealing with issues of cross-border attachment of incorporeal assets.